Samos is a fairly large island and good outcrops are sometimes hard to get to. The road system improved considerably over the last decade. The locations of the stops are shown on the simplified road map in Figure 11. We arranged the stops based on infrastructural and geographic constraints and not by geologic themes. The last time we visited Samos was in September 2001 and due to considerable efforts in improving the roads and building tourist facilities things may have changed since then. The field trips start from Samos town, which is the main town on Samos. The best road map is from ROAD Editions. Simplified road map of Samos with locations of stops. The first stop is an abandoned diasporite mine in eastern Samos. Drive from Samos town to the ENE (Kamara, Profitis Ilias). Just before the road starts to climb up towards Profitis Ilias take a right towards Agia Varvara and Mourtiá. Down near the beach there are stairs going up to the south, follow them and then keep going south until you reach the northern slopes of Mikri Lakka Bay (the hike takes about 20-30 minutes). The abandoned metabauxite mine is in greyish marble of the Ampelos nappe. Metabauxite is relatively common in marble of the Cycladic blueschist unit throughout the Aegean and shows that the marble was periodically above sea level and received sediment from nearby continental sources. The Al-phase in this outcrop is diasporite (Fig. 12) and attests that maximum metamorphic temperatures did not exceed ~470-480°C (Mposkos 1978). In western Samos, corundum is the main Al-phase indicating higher temperature conditions in western Samos. Assemblage diasporite (white) + chloritoid (different shades of blue) in metabauxite; sample Sa80-185 from abandoned diasporite mine, Mikri Lakka Bay, East Samos (plane-polarized light, photo width 4 mm). At the northern end of the small Gankou bay quartzite and quartzitic schist containing several millimeter large chloritoid crystals is exposed. The rocks in the outcrop are characterized by a penetrative S1/S2 foliation. An E-W trending stretching lineation, STR1/2, occurs on the foliation planes and this lineation is expressed by stretch quartz-albite aggregates and aligned phengite. Occasionally small-scale intra-folial folds with axes parallel to STR1/2 can be observed. 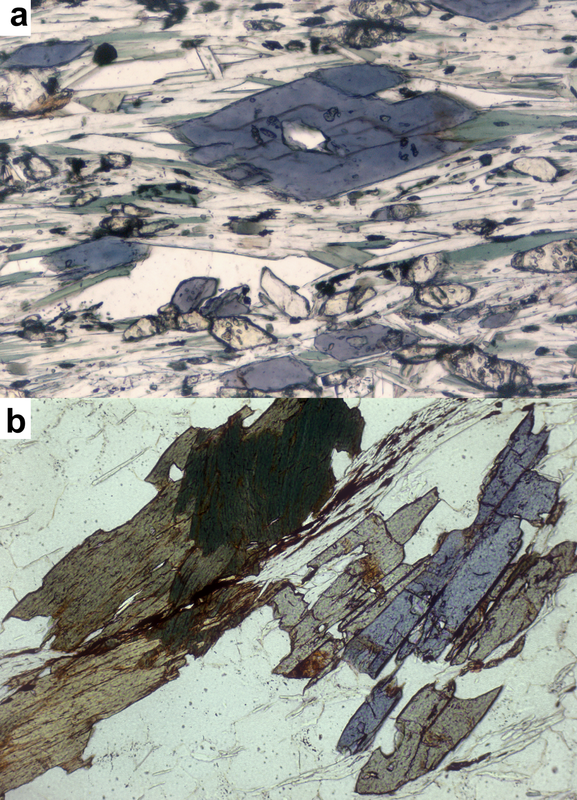 Thin sections are dominated by the assemblage chloritoid + phengite + quartz (Fig. 13). Chloritoid is commonly rotated. Gessner et al. (this issue) described very nice examples of rotated chloritoid and kyanite form this rock unit in adjacent western Turkey. Assemblage chloritoid (light olive green) + phengite + quartz in metapelitic schist; chloritoid is rotated; sample Sa80-222, Gankou Beach, Eastern Samos (plane-polarized light, photo width 3.7 mm). Ring et al. (2007) dated a mylonitic quartzite from this outcrop, which structurally belongs to the upper contact of the Ampelos nappe and thus is considered part of the Selçuk normal shear zone. Rb-Sr analysis of the minerals that constitute the mylonitic foliation has been hampered by the lack of apatite and problems producing a clean feldspar fraction. Magnetic separation of the white mica populations revealed two chemically distinct white micas. Rock texture suggests that some of these phengite/paragonite intergrowths form textural relics within an otherwise penetratively deformed matrix (see figure 5c in Ring et al. 2007). Rb-Sr data show that there is no age-grain size correlation, which is in line with complete synkinematic recrystallization as inferred from textural observations. Despite evidence for incipient weathering, the whole rock was analyzed as well. Integration of the whole rock data with the different white mica results leads to an apparent deformation age of 37±5 Ma which we interpret as an accurate estimate for late stages of mylonitic deformation. 40Ar/39Ar spot-fusion ages show a large variation in ages of ~10 Ma. Two pre-mylonitic, non-recrystallized, high-Si phengite/paragonite intergrowths in sample Sa01-1 yielded ages of ~50 Ma. The mylonitic phengite yielded no spot-fusion ages >~42 Ma. Analyzed spots from relatively coarse-grained (~60-80 μm), early recrystallized phengites in mylonitically sheared layers give systematically older ages than spots from late-stage recrystallized phengites (>~50 μm). We interpret the scatter of the ages to be due to progressive recrystallization of phengite. Accordingly we propose that the scatter in ages reflects different increments of shear-zone deformation. Drive from Samos town towards Kokkari and Karlosvasi. About 2 km west of Samos the road goes through smoothly rolling hills made up primarily by Pliocene porous lacustrine limestone, with subordinate tuffaceous marl and silt of the Kokkari Formation. Thin-bedded marl of Hora Formation crops out. Towards the top of the exposed section the marls have abundant conglomerate and breccia horizons that signify tectonic uplift related to D4 shortening. The view from the road towards the south shows a huge marble sequence of the Ampelos nappe in the west. The relief between the top of the marble and the Neogene sediments of the Mytilini basin to the east is more than 500 m and the structural relief is more than 1000 m.
In the road cut a D4 reverse fault puts marble of the Ampelos nappe above Tortonian marl of the Hora Formation. The fault dips WSW and the shortening direction is WSW-ENE. The sedimentary material is in part silicified; drusy quartz fillings and red iron staining is common in places. Less than 1 km west of Stop #1.3 there is a turnoff to the south to Vourliotes. The road climbs up in marble of the Ampelos nappe. In Vourliotes turn left to the monastery of Moni Vronda. Just before you reach the monastery you will find glaucophane-bearing chlorite-rich schists in a little forest to the left of the road. The glaucophane needles are in part well oriented in a NW direction and in part grew randomly on the foliation planes. In thin sections the assemblage glaucophane + epidote + chlorite + phengite + quartz is common in metapelitic schist (Fig. 14a). Further ahead on the right-hand side of the road opposite of the monastery chloritoid-bearing metapelitic schist is exposed (Fig. 14b). (a) Assemblage zoned glaucophane (blue) + epidote (yellowish grey) + chlorite (green) + phengite + quartz in metapelitic schist from sample Sa79-74, Moni Vronda, central Samos (plane-polarized light, photo width 0.15 mm). (b) Assemblage chloritoid (blue or light olive-green) + chlorite (yellowish green to dark green) + phengite + quartz in metapelitic schist from sample Sa80-190, Moni Vronda, central Samos (plane-polarized light, photo width 1.4 mm). Garnet-mica schist and garnet glaucophanite of the Agios Nikolaos nappe are exposed in a road section. Both rock types preserve excellent high-pressure parageneses (Fig. 15). The main foliation in outcrop is considered to be S2 and started to develop during high-pressure metamorphism and was then retrograded during ongoing deformation as evidenced by chlorite growth in garnet rims. The internal foliation within the garnets is a high-pressure foliation defined by aligned glaucophane (Fig. 15). (a) Assemblage phengite + quartz in metapelitic schist, sample Sa83-527, Livadaki E of Agios Konstandinos, north coast of Samos; internal foliation in garnet folded, formation of penetrative S2 wrapping around garnet (crossed polarized light. photo width 7.8 mm). (b) Assemblage garnet (yellow) + glaucophane (light blue) + epidote (yellowish grey) + phengite + quartz + titanite, garnet shows rotated inclusions of glaucophane (darker blue, richer in Fe), sample Sa80-200, Livadaki E of Agios Konstandinos, north coast of Samos (plane-polarized light, photo width 2.4 mm). (c) Assemblage garnet + chloritoid (light green or blue) + chlorite (light green) + phengite + quartz in metapelitic schist, garnet is rotated and partly replaced by chlorite, sample Sa83-514, Livadaki E of Agios Konstandinos, north coast of Samos (plane-polarized light, photo width 4 mm). (d) Garnet + chloritoid + chlorite + phengite + quartz in metapelite, garnet is rotated and partly replaced by chlorite, sample83-154, Livadaki E of Agios Konstandinos (plane-polarized light, photo width is 4 mm). Further west on the northern (beach) side of the road is a house-sized dark-green block of well-foliated garnet glaucophanite. The foliation is defined by aligned glaucophane and formed during high-pressure conditions. There is abundant evidence for quartz/calcite-filled veins. Sample 83-510 yielded the highest pressure recorded on Samos and Will et al. (1998) reported P-T conditions of ~18-19 kbar and ~530°C. Along the road rocks of the Agios Nikolaos nappe are intruded by trachyte. Further south the trachyte also intrudes rocks of the overlying Ampelos nappe. The greyish trachyte forms spectacular cliffs, a few hundreds of meters high (Fig. 16) and in part shows nice alkali-feldspar crystals. Spectacular cliffs made up by trachyte. The road to Kosmadei is quite long and winding, so the drive from Karlovasi to Kosmadei might take more than 30 minutes. In the village, especially in the southern and southwestern parts of the village, dark-green, coarse-grained, glaucophane-bearing metagabbro is exposed. Our tectonic interpretation is that the metagabbro represents slices of the Selçuk nappe within the Ampelos nappe. The metagabbro is usually a fairly massive, dark-green rock containing barroisitic amphibole and in part omphacitic pyroxene. A sample from Kosmadei yield a pressure of ~8 kbar and a temperature of ~410°C (Table 3). This stop is shown as site 1 in Figure 17. On the rocks directly west of Karlovasi harbour signs of notches, at least 2 m above sea level, though not well developed, can be observed all along the coast towards Potami Beach. Raised beaches in NW Samos (from Stiros et al. 2000). On the beach directly east of the white chapel of St. Nicholas at Potami a well preserved colony of vermetids (mainly Vermetus triqueter) has built a thin reef capping slabs of beach rock, up to 50 cm above sea level (Fig. 18). These species live in the infra-littoral zone and they do not represent good indicators of sea level. However, as they are confined to the lower part of the beach rock slabs, their upper part is likely to correspond to the sea level of the period they were living. On the nearby rocks, remains of vermetids (colonies of Dendropoma petraeumand and isolated Vermetus triqueteur) were found at two distinct levels: on average 0.6 m and 1.1 m above sea level on coastal rocks. Both levels have been interpreted by Stiros et al. (2000) as fossil shorelines. Details of the raised vermetid micro-reef capping at about 10.5 m a beachrock slab, on the beach east of the St. Nicholas Chapel. The Vermetid layer consists mostly of Vermetus triqueter (photograph from Stiros et al. 2000). Along parts of the eastern side of the Punta Promontory, at the western edge of Potami Beach, there is clear geomorphological evidence of at least three fossil shorelines: two benches, 0.6±0.2 m and 1.1±0.2 m above sea level, and a narrow notch at a height of 2.3±0.2 m (Fig. 19). The lithology is non-uniform even at the scale of a few meters, so these features disappear at the tip of the cape, but reappear on the coast west of the promontory. Raised shorelines at Punta. The feet of the person are on the two low benches (about 0.6 and 1.1 m in altitude) and his head is at the elevation of the upper notch (~2.3 m above sea level) (photograph from Stiros et al. 2000). No biological traces have been found on the two benches, but remains of two polystromatic colonies of Dendropoma petraeum, 0.7±0.2 m and 1.1±0.2 m above sea level, respectively, have been found at the eastern edge of the Punta Promontory. These two colonies are interpreted to correspond to two fossil shorelines, geomorphological evidence of which consists of the two adjacent benches. In this outcrop two benches are at a slightly higher (about 20-30 cm) level, probably due to higher wave energy. The 1.5 m high platform looks like a former surf bench, locally more than 1 m wide, and forms an arch at the cape of the eastern edge of the cove (Fig. 20). The corresponding sea level in such a case should be identified at a level of at least 20±30 cm lower than the bench rims (Pirazzoli 1996). The upper notch, although not well developed, is also discernible at ~2.4±0.2 m above sea level (Fig. 20). Mikro Seitani cove showing two coastal platforms and a notch above them testifying to the three fossil Holocene raised beaches (photograph from Stiros et al. 2000). Take the main road to Marathokambos, which climbs smoothly up through marl of the Hora Formation. The thinly bedded marl is exposed in many road cuts. The marl frequently shows slumps and other features of soft-sediment deformation and was deposited in a relatively deep lacustrine environment. 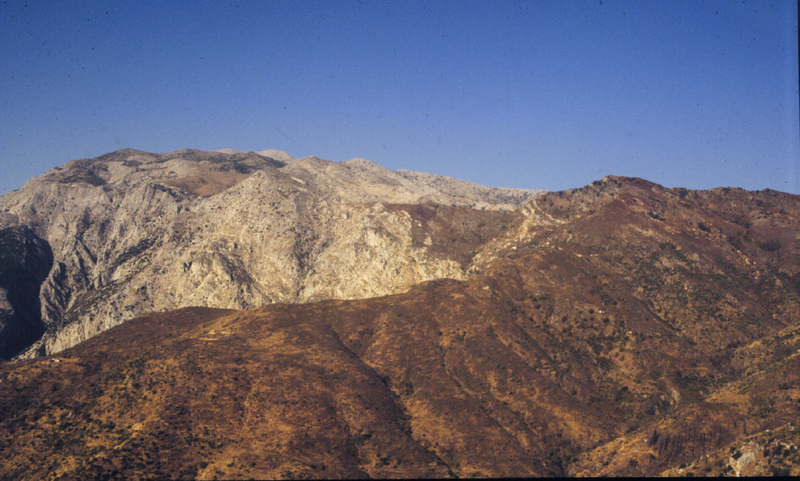 Reddish conglomerate is exposed on the northern side of the road (Fig. 21). 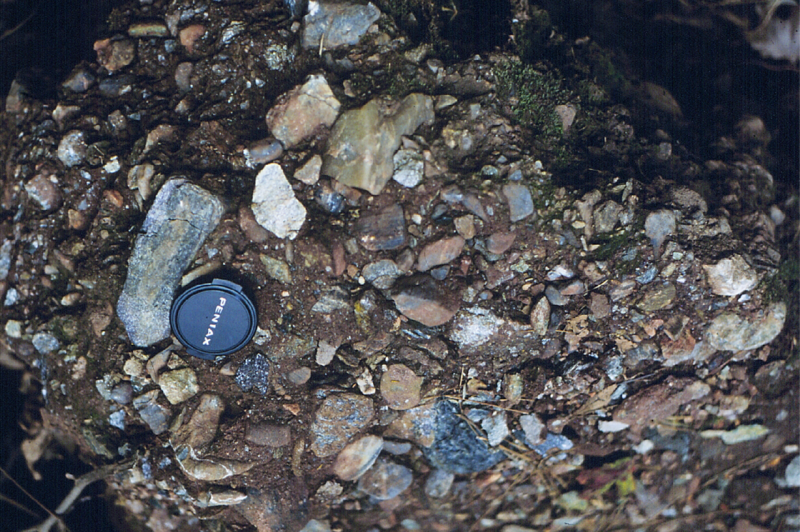 The conglomerate rests above the unconformity in the basin succession. The unconformity and the fluviatile depositional environment of the conglomerate is the consequence of the short-lived D4 shortening event that caused uplift of the region. The uppermost beds of the Mytilini Formation are tuffaceous sands and marls signifying a change from fluviatile to lacustrine deposition due to subsidence related to D5 normal faulting. (a) Conglomerates near turnoff to Platanos; grain size gets larger towards top of outcrop. (b) Section below that shown in (a) depicting more marl horizons. There are abundant rhyolite clasts in the conglomerate indicating that the rhyolite is older than ~9 Ma. Furthermore, abundant metamorphic rocks can be found in the conglomerate. Stroll a few hundred meters downhill along the road to the east. Thinly bedded marl of the upper Mytilini Formation is exposed. The entire section is dipping to the NW. Walk another ~500-1000 m to the SE along the road you find slump folds in marl (Fig. 22a). The marl is thinly bedded and commonly shows evidence for soft-sediment deformation. In a large road cut on the NE side of the road the slump folds are folded by upright D4 folds (Fig. 22b). The harder carbonate layers are frequently boudinaged in the limbs of the folds. (a) Slump folds in marl; marl in outcrop is thinly bedded; horizons characterized by slumping are restricted to a few layers in marl. (b) Upright D4 fold in marl folding slump folds; good example can be seen in right limb of fold. Drive a few hundred meters to the SE through pyroclastic rocks until you reach the turnoff to Koumeika. Walk up the gully opposite the turnoff to Koumeika. Greyish dacite with feldspar and hornblende phenocrysts are exposed. Further up to the NE dark basalt is exposed. Occasionally pyroxene and biotite crystals can be found. The volcanic rocks intruded at the boundary between the Neogene sediments and pyroclastic rocks of the Karlovasi basin and marble of the Ampelos nappe to the E. The marble crops out along the road to Pyrgos to the E of the Koumeika turnoff. Follow the road to Koumeika. In road cuts just south of the turnoff thick-bedded, greyish-yellowish-white limestone of the Pythagorion Formation crops out. The limestone was deposited in a shallow lacustrine environment. Freshwater gastropods, stromatolites and onkolites occur and dessication cracks and wave ripples are common. Near the volcanic rocks the limestone in locally strongly silicified. Tuffaceous layers may also occur. The thick-bedded limestone laterally interfingers with the thin-bedded marl of the Hora Formation, indicating rapid lateral variations in the depositional environment of shallow to relatively deep lacustrine conditions. A view towards the E shows the limestone in the hills below the main road to Pyrgos and marble of the Ampelos nappe along the road. Both lithologies are separated by a S-dipping D5 normal fault. In Koumeika turn E to Skoureika. You will drive through gently rolling hills made up by thick-bedded limestone of the Pythagorion Formation. About 500 m W of Skoureika you should start seeing coarse, reddish-brown breccias. The age of the breccia is not known but older than 11.2 Ma. At the base the cobbles are poorly sorted and angular; some boulders may reach 1 M3 in diameter. The pebbles are entirely metamorphic rocks (quartzite, marble and phyllite) (Fig. 23). Cross-bedded sands occur above those cobbles and may have been channel fills of rounded gravels. At the top brown to yellow siltstone with thick palaeosoils frequently cut by gravels occur. Weidmann et al. (1984) interpreted the depositional environment as a proximal to distal floodplain. Basal Breccia; the clasts are mainly derived from the nearby metamorphosed nappes. Weidmann et al. (1984) argued that the pebbles derived from the local basement (Cycladic blueschist unit). This view is in line with the zircon-fission ages of Brichau (2004) yielding ages between 20 and 18 Ma. Leave Skoureika and turn N to Neochori. Where the road meets the main Pyrgos-Karlovasi road epidote-glaucophane schist is exposed on the northern side of the road. Due to extensive improvement of the road the outcrops have changed considerably in the past years. The well foliated rocks are characterized by large prismatic, dark-blue to black glaucophane reaching 1 cm in length. The glaucophane sits in a yellowish-green matrix made up primarily by epidote with subordinate chlorite. The best place for staying this night might be Ormos Marathokambos. In the southwestern corner of Marathokambos turn into a small road that goes off to the west (follow sign to Pythagoras cave). Follow the dirt road for about 1.5 km and then deformed granites are exposed in the cliffs on the right hand side of the road. The granite is strongly foliated and the foliation wraps around feldspar porphyroclasts. 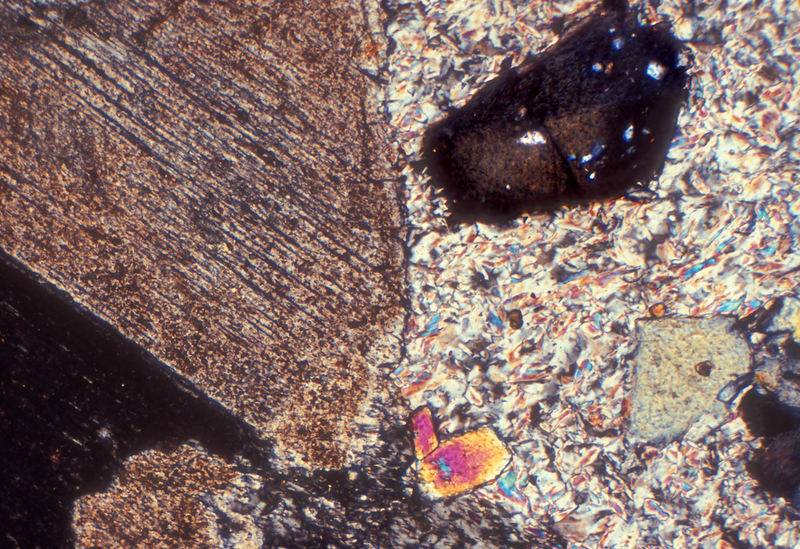 Single-zircon dating yielded a Triassic age for the granite (Ring et al. 1999a). Ar-Ar dating of hornblende, biotite and white mica by Ring and Layer (2003) yielded very complicated Ar-diffusion spectra. The oldest event is seen in the hornblende with an age of up to 220 Ma. The next age seen in all three dated minerals is a ~55-60 Ma age. This is an excess Ar event in hornblende, a plateau age in biotite and a ‘highest temperature age’ in white mica. Both biotite and white mica also show evidence for a 20-25 Ma event. This event is reasonably well recorded in the white mica at 25.5±1.7 Ma, which is probably the best representation of that event. In white mica, an ‘intermediate’ age at 37.4±1.1 Ma is represented as a fairly well-defined plateau. If you follow the road for another 1-2 km you will reach dolomite of the Kerketas nappe after a hairpin in the road. Up the cliff to the west is a cave. Legend has it that Pythagoras lived in that cave for a while. The cave is in dolomite of the Kerketas nappe, which is in high-angle fault contact with the Ampelos nappe here. However, to the N this contact is well exposed on a ridge. From Pythogaras cave either follow the road to the southern coast or turn round and go back to Marathokambos; 1 km NE of Marathokambos take the road to Kastania and after about 100 m turn left and take a dirt road to the windmills – there are a bunch of modern windmills and some ruins of old windmills. Carry on for about 5-6 km up the hill until you reach the top of a saddle from where the road drops down to the N – park your car here and follow a goat track to the west. You will walk through a generally moderately E-dipping variegated sequence of phyllite (in part carbon bearing and thus dark grey to black), marble, greenschist, chlorite-rich schist and quartzite. Most rocks are strongly foliated and have a WNW-trending stretching lineation. After about 1 km you will reach the greyish-white dolomites of the Kerketas nappe. 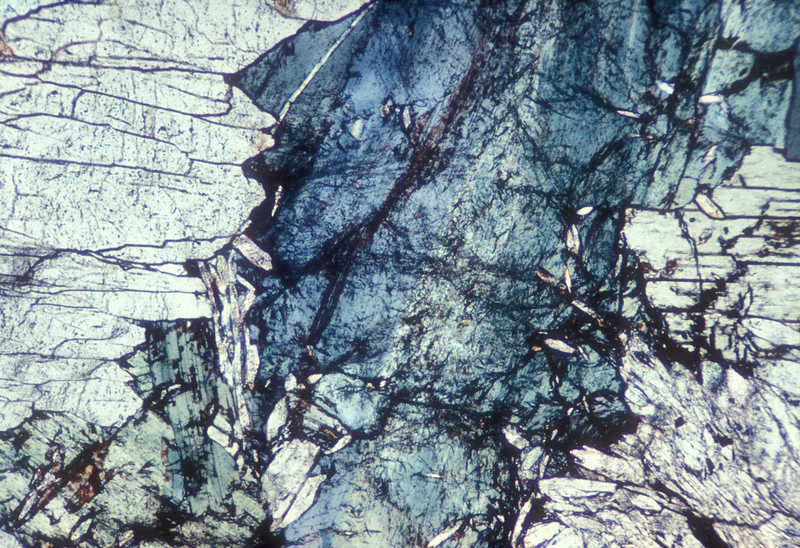 Directly at the contact a dolomite slice occurs in the phyllite. The contact zone is well exposed but no distinct mylonitic shear zone has been mapped. Instead it appears that the relatively strong deformation recorded in the Ampelos nappe rocks on the ridge took up the deformation heterogeneously. The dolomite of the Kerketas nappe appears hardly deformed at all. 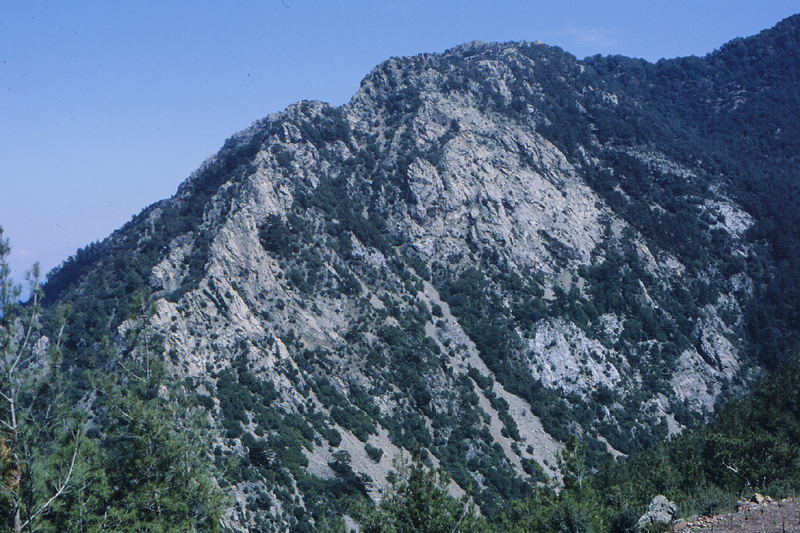 Panoramic view of contact between Ampelos nappe to right and light-grey, dolomitic marble of Kerketas nappe to left; schists of Ampelos nappe are usually covered by greenish-brown vegetation, whereas dolomite commonly has no vegetation, sequence dips to E (i.e. right). Matthias Bernet measured quartz-c-axis fabrics from quartzites along the contact zone and 8 out of 9 samples yielded an asymmetric fabric indicating a top-ESE shear sense. One single zircon fission-track age of 14.1±1.2 Ma from a metamorphosed conglomerate at the southern slop of the Kerketas nappe (Stop #4.1) is about the same age as the supposed age of the breccia at the base of the Neogene sequence of the Karlovasi basin. Because the closure temperature for fission track in zircon is about the same as the lower limit of quartz ductility (~280°C), the top-ESE shear sense might be Middle Miocene in age and related to extensional reactivation of the Kerketas/Ampelos nappe contact and formation of the Neogene basins on Samos Island. Note that the reasoning is somewhat circumstantial. If you enjoy hiking you may find your way up to the top of Kerkis Mountain. Towards the top you will probably walk through a variegated sequence of Ampelos nappe rocks again with in part large and beautiful glaucophane crystals (however, that depends on which route you choose in this rugged terrain). Spend night again in Ormos Marathokambos. Drive past Votsolakia and then turn to the N; the footpath to Monastery Evangelistria should be signposted. Have a quick stop at the turnoff and look at the impressive mountainous massif of Kerkis. The monotonous dolomite is exposed (on the northern side of the Kerketas Massif) from the top of the massif all the way down to sea level and the only unit in the central Aegean that compares lithologically to the Kerketas nappe is the Almyropotamos nappe of Evia. Both nappes experienced a poorly defined high-pressure metamorphism (~8-10 kbar and 350-400ºC) in the Early Miocene at 24-21 Ma (Ring et al. 2001; Ring and Reischmann 2002, Ring and Layer 2003). Follow the dirt road until you reach the path and walk up the hill. After a while you will reach the contact between the Ampelos and Kerketas nappes again, which here is a subvertical brittle fault. A ~1 m thick fault zone is exposed in the footpath and the sense of displacement is S-side down. Carry on along the path to the monastery. Just below the monastery metamorphosed conglomerates are exposed. These conglomerates yielded the zircon fission-track age of 14.1±1.2 Ma (see Stop #3.2). The mean extension direction of the clasts is towards 70°. We also performed an Rf/φ analysis which yielded slightly prolate strain geometry. Axial ratios in the XZ plane range from 3.1-8.3. You might climb further up beyond the monastery and reach the peak of Kerkis Mountain from the southern side. The hike is certainly worthwhile to do and also gives you an impression of the sheer thickness of the monotonous dolomite of the Kerketas nappe. The views from the top are great. When you drive towards the N to Kallithea you will see the rugged cliffs made up by the dolomite of the Kerketas nappe to your right (Fig. 25). 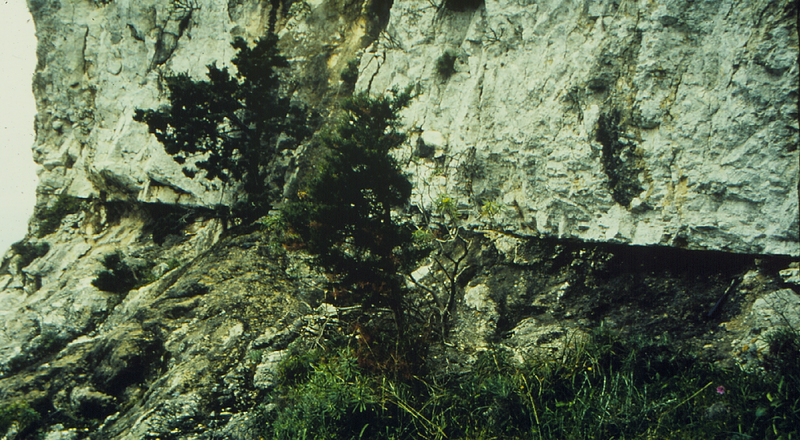 The dolomite also occurs as slices and blocks within the Kallithea nappe (Fig. 5). Another panoramic view of Kallithea nappe (covered in forest) and light grey dolomite of underlying Kerketas nappe; note that Kerketas dolomite also occurs as blocks and slices within Kallithea nappe; view from the N.
About 500 m S of Kallithea to the W of a 90° curve in the road brownish-red radiolarite of the Kallithea nappe is exposed in the road cut. The radiolarite is in fault contact with basalt and altered peridotite. The radiolarite is well-bedded on the cm scale and bedding is fairly steep in the outcrop. The basalt may show well-preserved pillow structures but is commonly strongly cataclastically deformed. Near faults the basalt becomes green due to hydrothermal alteration. Stroll around the next bend in the road towards Kallithea and after ~100 m or so you will be in fine-grained whitish to grey limestone of the Kallithea nappe. Bedding is only occasionally discernible as a layering on the dm scale. Try to find Megalodon, which may be as large as 10-12 cm (Theodropolous 1979) and indicates a Late Triassic age. Furthermore, lamellibranchiata and gastropods can be found; Theodropolous (1979) reports ostracodes, radiolaria and Jurassic Valvulinidae based on thin-section observations. It is quite tricky to find the right turnoffs. Find a dirt road just to the S of Kallithea and follow that road downhill. Bear right initially, then you will come to a curve bending left and you need to take the road to the S here (the one that continues going downhill), take another left at the next intersection. Once you reach light grey dolomites you are in the Katavasis complex. There is a distinct 10-20 cm thick horizon of grey to dark grey cataclasite at the top of the dolomite. Now you are where the blue strike and dip sign SW of Kallithea is on the map in Figure 5. You can either hike down a little valley to the beach or continue by car to Katsouni Bay and walk to the N from there. Eventually you will hit a fairly steeply S/SE-dipping sequence of amphibolite and quartzite. The amphibolite crops out on the beach and the quartzite crops out above the amphibolite. Occasionally hornblende crystals in the amphibolite are >1 cm in size. The rocks are metamorphosed at amphibolite-facies conditions. 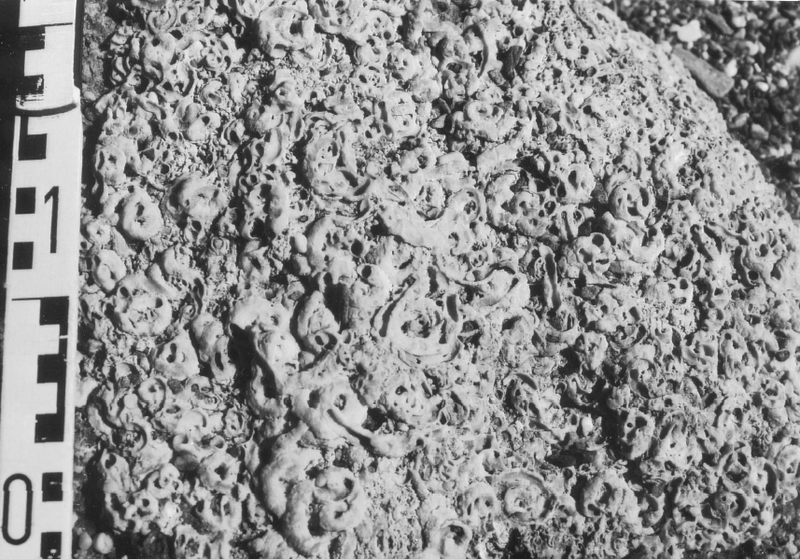 Mezger and Okrusch (1985) speculated that the Katavasis complex belongs to Cretaceous high-temperature rocks, which form crystalline slices within the Cycladic ophiolite nappe on other Aegean islands. The amphibolite and quartzite have a distinct amphibolite-facies foliation and stretching lineation, which is thought to be a relic of the earlier tectonometamorphic history of the Katavasis complex before being emplaced on Samos. Intruded into this sequence are numerous subvertical, a few decimeter to meter wide granodioritic dikes. One of these dikes yielded an Ar-Ar age of 10.2±0.2 Ma (F. Henjes-Kunst unpubl. data). Stephanie Brichau obtained a zircon fission-track age of 7.3±1.0 Ma from one of the dikes (N37°42’52”, E26°34’06”). Just N of Kallithea there is a turnoff to the left towards Agios Isodoros. The church is in marble and phyllite of the Ampelos nappe. Park the car in the second valley after the turnoff N of Kallithea and make your way down the valley to the sea. Where the creek meets the sea turn to the left and you will find a small slice of Kerketas dolomite tectonically above amphibolite-facies dolomite of the Katavasis complex. The grey Kerketas dolomite is relatively fine grained and appears hardly deformed in outcrop. In contrast, the underlying dolomite of the Katavasis complex is coarse grained and more whitish in colour. At its top, at the tectonic contact, the Katavasis dolomite is strongly cataclasized and becomes greyish-black in colour. The subhorizontal contact zone is almost knife sharp and very distinct in the field (Fig. 26). Knife-sharp contact between Kerketas nappe (top) and dolomite of Katavais complex (bottom); dolomite is strongly cataclastically deformed below contact and contains phyllitic lenses. On the main road from Kallithea towards Drakei, cataclastically deformed pelitic and dolomitic rocks of the Kallithea nappe are exposed in road cuts. Each spring the outcrop situation is different but usually asymmetric brittle structures can be found frequently. Riedel shear and other brittle shear-sense indicators yield top-NW senses of shear (Fig. 27). Brittle deformation in Kerketas nappe (a) Brecciated and cataclastically sheared dolomite layer in shale indicating top-NW (left) shear sense. (b) Strongly cataclastically reworked shale/dolomite sequence. Overnight either in Votsolakia or again in Ormos Marathokambos. Drive back up to Marathokambos and take the main road to Pythagorion. In Pyrgos, take a sharp right turn to the S towards Spatherei and Pagondas. About 1 km W of the turnoff to Monastery Evangelistrias a sequence of metagabbro and serpentinite of the Selçuk nappe is exposed. There are numerous steeply dipping faults disrupting the sequence. The metagabbro is usually a massive darkgreen and white rock and does not show much evidence for deformation. However, occasionally flaser gabbro occurs and the spotty green/white appearance gives rise to a foliated fabric in which greenish and whitish layers alternate. Dark-green serpentinite commonly is well foliated and quite often contains several millimeter big euhedral magnetite crystals. Metagabbro sample Sa80-230 described in Ring et al. (2007) is from this sequence. The metagabbro is massive and contains omphacite. Furthermore, green and colourless hornblende, diopsidic pyroxene, epidote, chlorite, albite, quartz, and accessory titanite. The metagabbro has a relict magmatic, massive texture: large, anhedral magmatic green hornblende is rimmed by pale green to colourless actinolite and actinolite-chlorite±titanite intergrowths. Magmatic clinopyroxene is rimmed by green hornblende and, in places, replaced by colourless chlorite. Albite both occurs as large poikiloblasts containing fine-grained actinolite, chlorite and epidote, and as fine-grained recrystallized minerals. Compositionally, the amphiboles range from almost pure actinolite to Mg-hornblende. Ca-pyroxene is a diopside-dominated solid solution of 63-75 mole% diopside, 17-21 mole% hedenbergite and 2-10 mole% enstatite. Na-pyroxene has up to 9.5 wt.% Na2O and forms a solid solution of 31-52 mole% jadeite, 9-25 mole% acmite, 30-54 mole% diopside and 1-7 mole% hedenbergite. Drive towards Pagondas, which sits on Neogene basin sediments, and then go towards Ireon. It is worthwhile to visit the temple of Heraion, which was built near the mouth of the river Imvrasos. Only one column of the Heraion temple remained intact (Fig. 28). 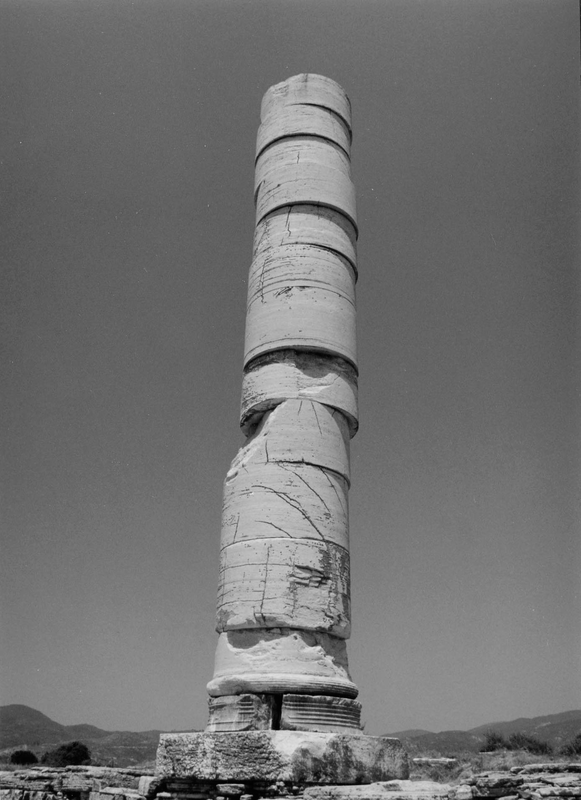 The only surviving column of the Heraion temple constructed in ~530 BC. Displacement of the drums is thought to be due to high seismic accelerations (Stiros 1996), similar to those expected to have been produced by earthquakes responsible for the coastal uplift of the Karlovasi area (photograph from Stiros et al. 2000). Then head towards Mili and from there to Koumadarei. There is a good mix of almost all rock types of the Ampelos and Selçuk nappe exposed in road cuts. About 1-2 km NW of Mili in a hairpin of the road, weakly deformed metagabbro is exposed. 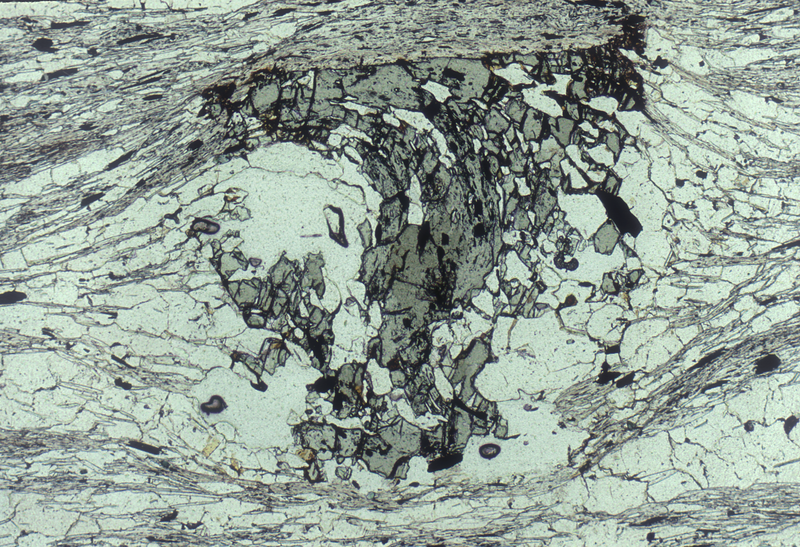 In thin sections, relic magmatic clinopyroxene is common (Fig. 29). Metagabbro with relics of igneous clinopyroxene and porphyroblasts of epidote in a matrix of phengite; sample Sa79-39, crossed-polarized light, photo width 0.9 mm. Further up the road opposite the turnoff to Monastary Mengali Panagia, strongly deformed chloritoid schist is exposed in the road cut on the left-hand side. In Koumaradei turn right towards Pythagorion and stop in a hairpin bend about 1 km E of Koumadarei. Towards the NE you see Neogene sediments of the Mytilini basin. To the E you look over Quarternary plains on which the airport of Pythagorion was built. In the distance the high mountains of Dilek Peninsula in western Turkey can be seen. Dilek Peninsula is made up of he same rock types as the Ameplos nappe and the Dilek nappe has been correlated to the Ampelos nappe by Ring et al. (1999b). The road down into the basin is in ordinary Ampelos marble. Near Gionidas take a left towards Mavradzei. The metagabbro is very similar to the one near Pagondas (Stop #5.1); however, in sample Sa79-42 pseudomorphs after lawsonite have been observed (Ring et al. 2007). The metagabbro has been caught-up in the Mavradzei fault zone and therefore has a subvertical foliation and contains numerous small-scale faults. In some of the outcrops decimetre-seized Riedel structures occur. Overnight in Ireon or Pythagorion.